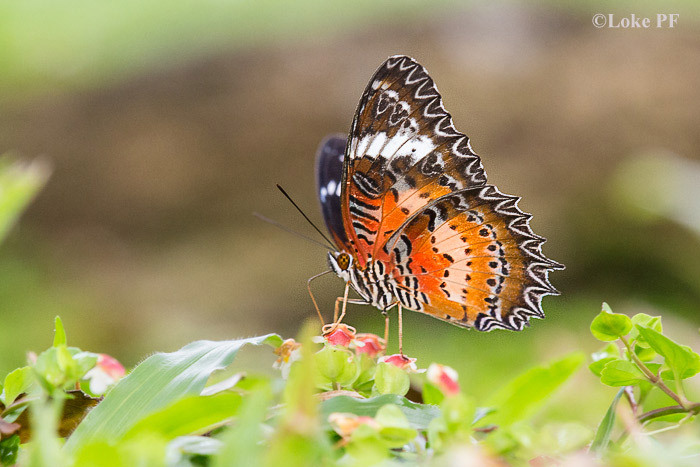 Over the years, there have been several additions to the Singapore Checklist of species that have either been seasonal visitors or some that have established viable colonies to be considered permanent residents in Singapore. In the families Lycaenidae and Hesperiidae, there are many lookalike species where just field shots of butterflies may prove challenging to identify. 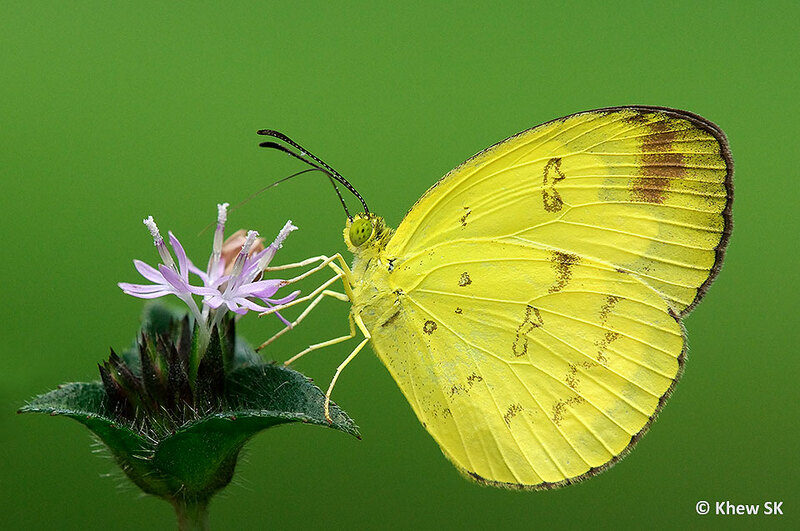 This is where voucher specimens are required, or where opportunities arise, the documentation of the early stages of the butterfly can help to confidently identify the species. In this series of updates to the Singapore checklist, we feature a total of six new species that have taken time to reliably identify these butterflies. 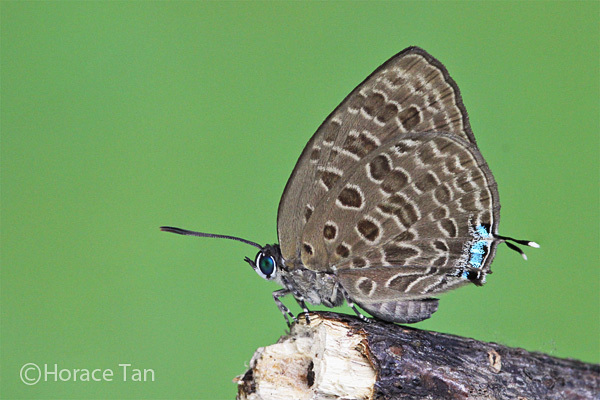 In this article, we feature two species that will now be added to the Singapore Checklist. 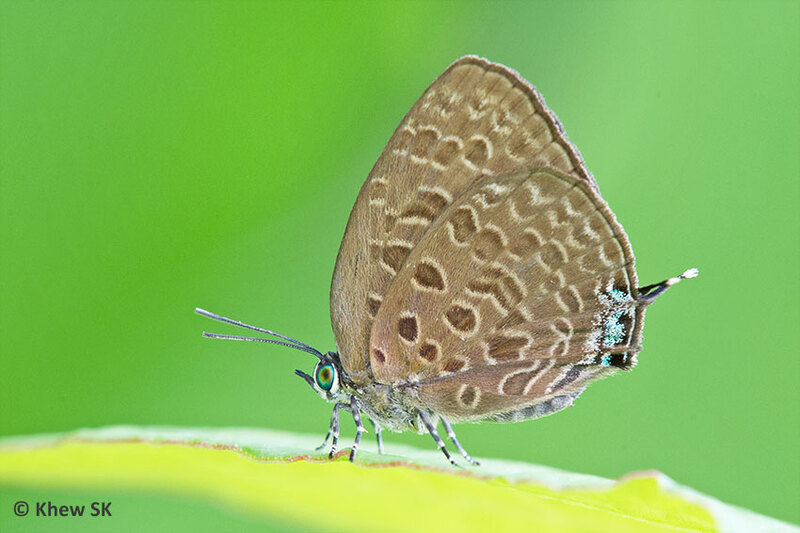 The first is a species from the genus Arhopala, a group of butterflies that are extremely challenging to identify from field shots alone. 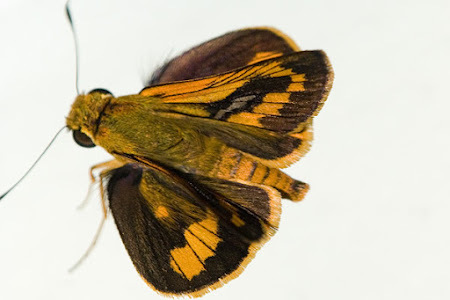 In several cases, the variability of the species in terms of its physical diagnostic features makes it even more difficult to ID the species accurately. 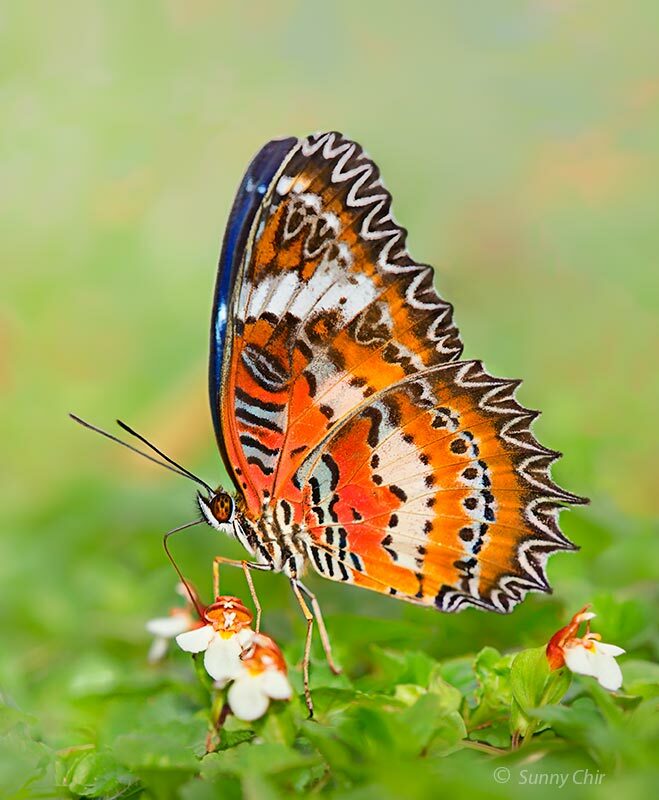 At times, both the upper and under side of the butterfly's wings need to be examined for a higher level of certainty of the ID. 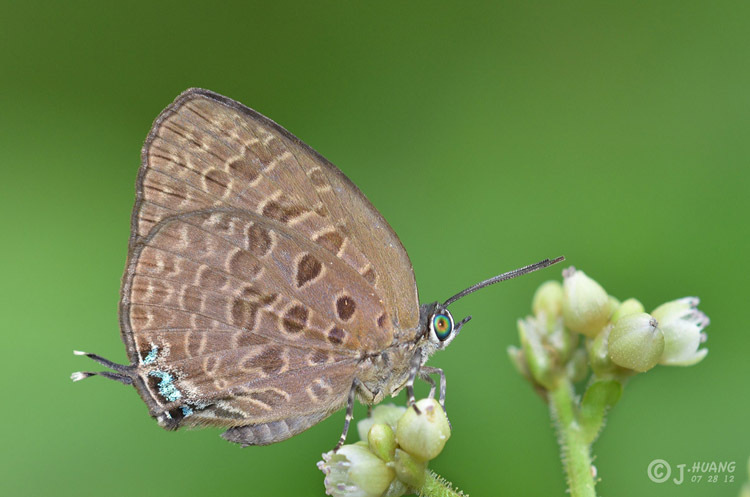 In the case of the Purple Broken-Band Oakblue (Arhopala alitaeus pardenas) the life history was documented and several voucher specimens examined before we recorded this as an extant species in Singapore. 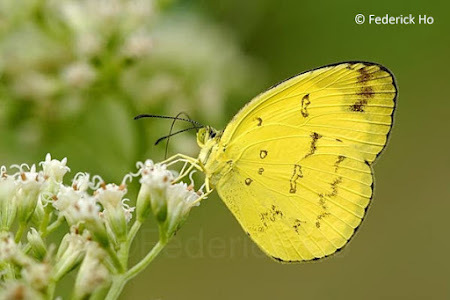 This species belongs to the alitaeus group of which there are at least nine species in Malaysia and Singapore. The diagnostic features to separate them require close scrutiny of specimens. 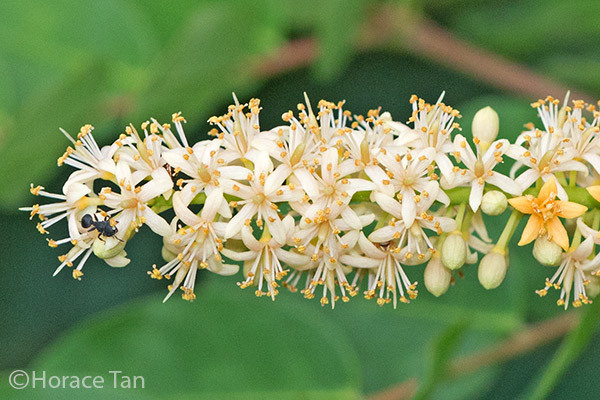 Based on the literature and records in C&P4*, two species of the alitaeus group, A. pseudomuta and A. alitaeus are extant in Singapore. 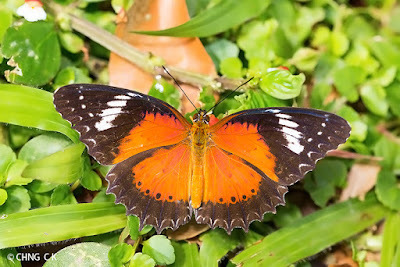 All the others are found in Malaysia and a few subspecies are isolated to the island of Langkawi. 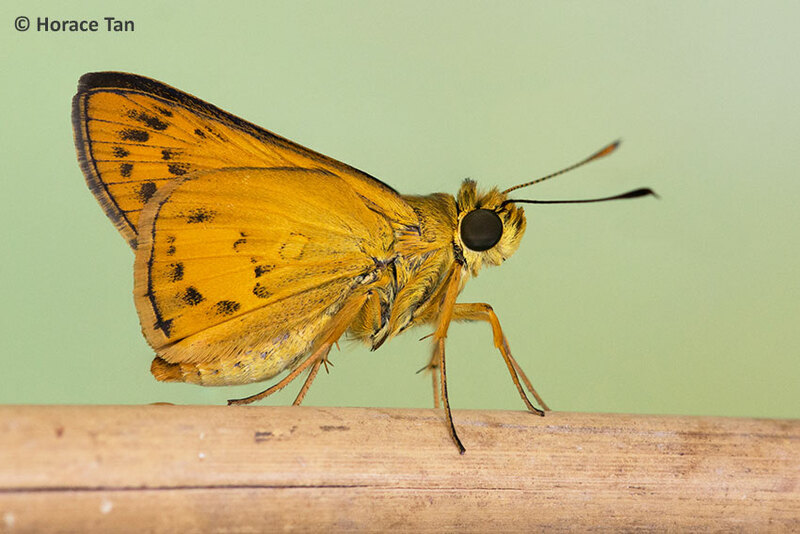 With the voucher specimens and scrutiny of the diagnosic features, we now have a higher confidence to record A. alitaeus pardenas as a re-discovery in Singapore. 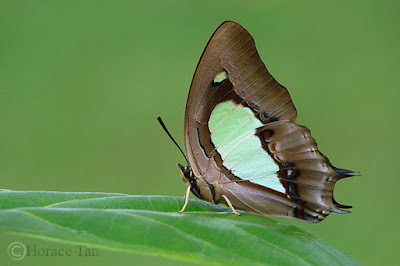 The Purple Broken-Band Oakblue (this name was taken from Pisuth's Butterflies of Thailand Book) is described as having a weak purplish glaze on the underside of its wings. 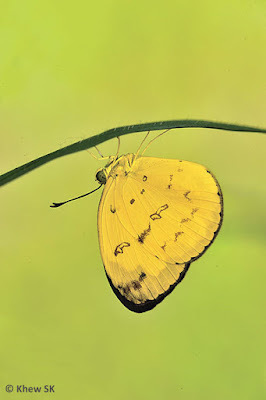 On the upperside, the male has a consistent 1.0 mm wide border and having more annular (curved or somewhat round in shape rather than jagged) markings on the underside. 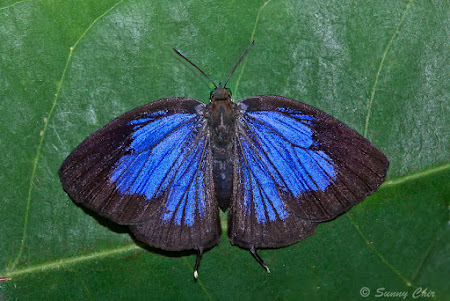 The female has a broad black border on both the fore- and hindwings. 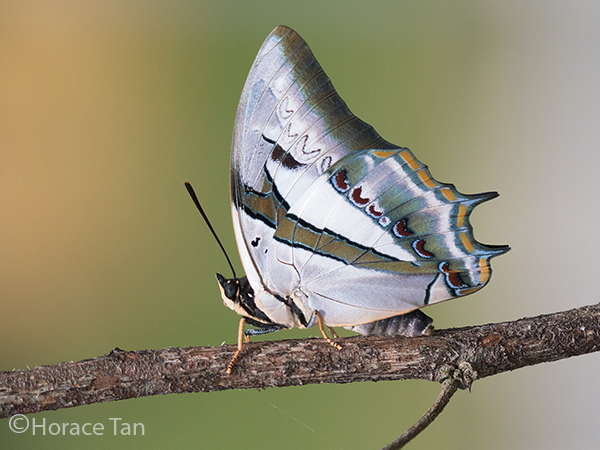 On the forewing underside, there is a spot at the base of space 10. 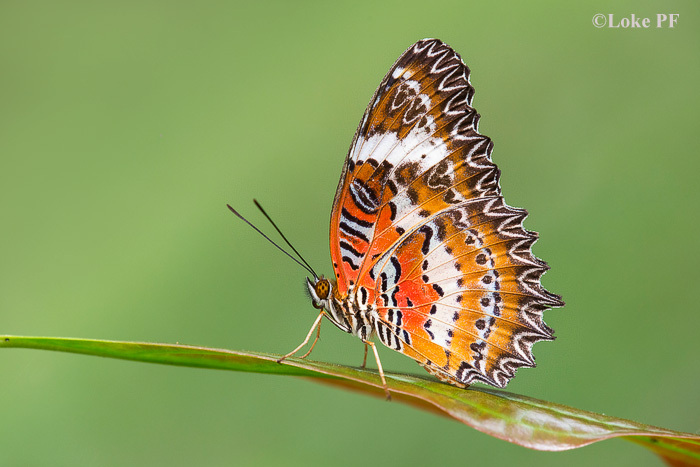 The post-discal spot in space 6 of the hindwing is rounded and overlaps the cell-end bar. The submarginal spots on the hindwing are individual spots versus band-like in the Raffles' Oakblue (A. pseudomuta). 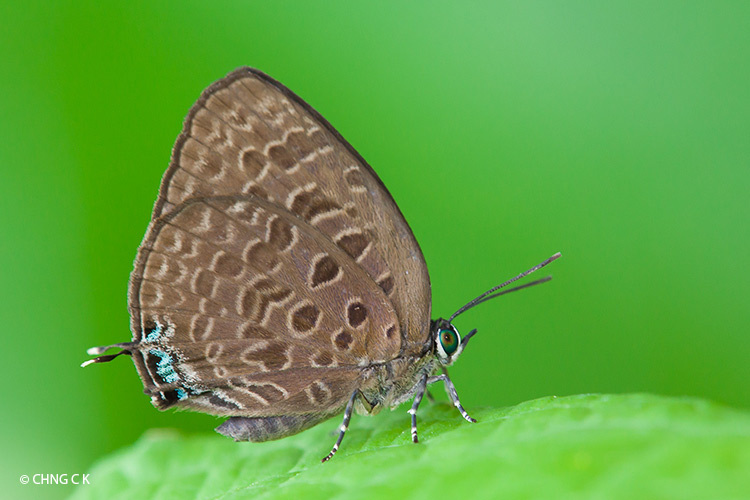 With voucher specimens and early stages record, we now document this as a re-discovery and add the Purple Broken-Band Oakblue (Arhopala alitaeus pardenas) as species #319 in the Singapore Checklist. 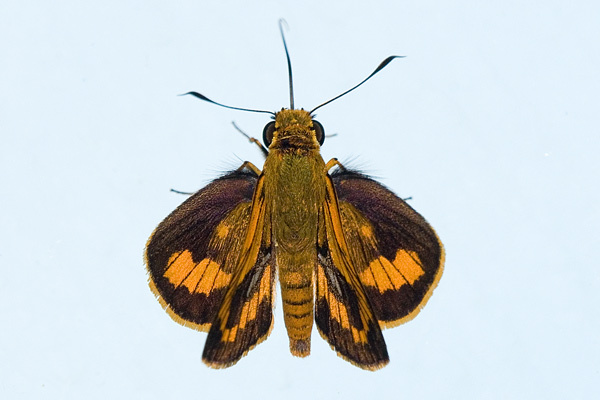 The second species to be recorded as a new discovery is the Linna Palm Dart (Telicota linna). 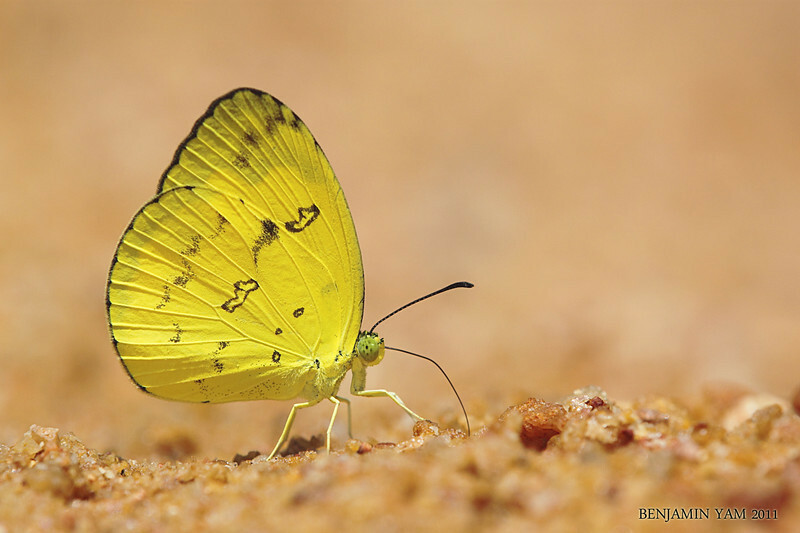 This species was not included in the early authors' checklists. Even as early as back in 2007, Horace Tan, our early stages expert, had bred this species on Bambusae, but identification at that point was lumped together with the extant species, T. augias. Dr TL Seow, our resident expert, had then tentatively identified it as T. ohara, another allied species due to the lack of a proper set specimen to refer to. There was another amateur who claims to have recorded this species three years later in 2010, but was not a trustworthy source as he had shown a propensity for posting untruths and slanderous accusations under fake accounts. It is also curious as to whether this character possessed the proper permits from NParks to take material out of areas under the legal jurisdiction of the Singapore authorities. It is regrettable that this unfortunate individual set up a so-called blog (obviously not credible nor widely read) to resort to his mud-slinging activities. Forewing with the base of space 2 black or largely so (sometimes with a bit of orange shading). 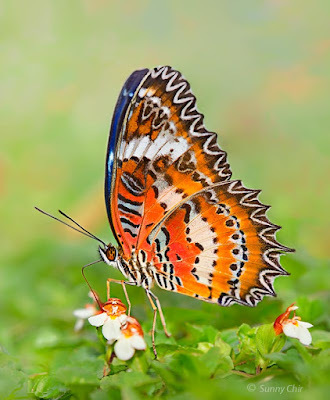 Brand usually straight and not placed closer to the forewing cell or inner margin. Underside hindwing veins across band not dark dusted. Forewing generally darker, with much of basal orange darkened. Forewing two cell end spots usually separate and roughly about equal in size. Underside hindwing veins across band not dark-dusted. It should be noted that for many of these lookalike species, the ID keys need to be combined with other diagnostic features and should not be used in isolation. 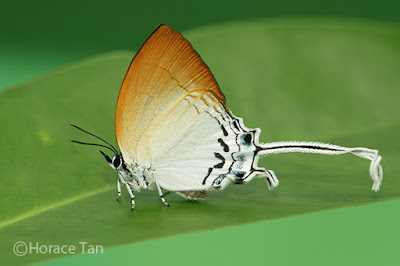 For example for the characteristic in the male where the base of space 2 is black, this feature is also present in the Malaysian species of T. ohara, T. bambusae and T. hilda. 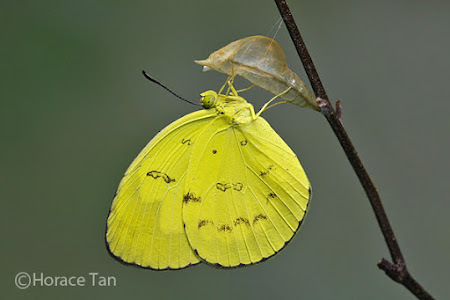 All of these species have yet to be observed in Singapore, although there is no particular reason why they will not appear here in future. 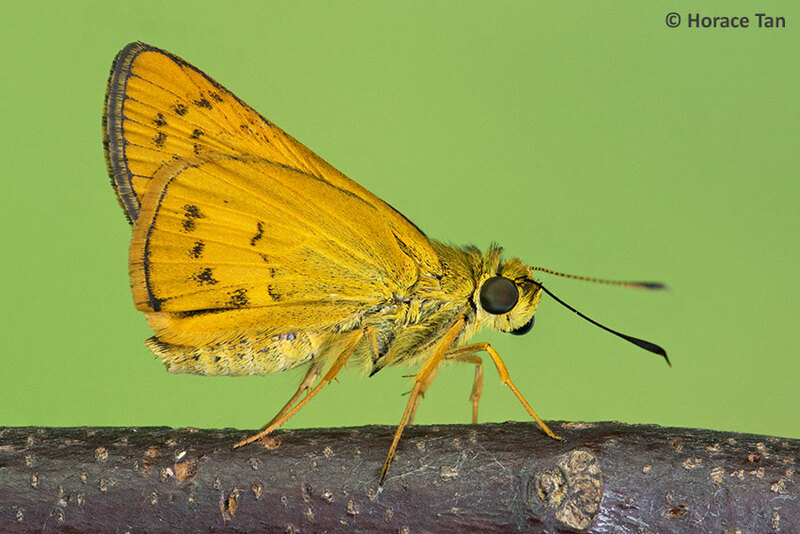 With the voucher specimens available, we now record the Linna Palm Dart (Telicota linna) as species #320 in the Singapore Checklist. 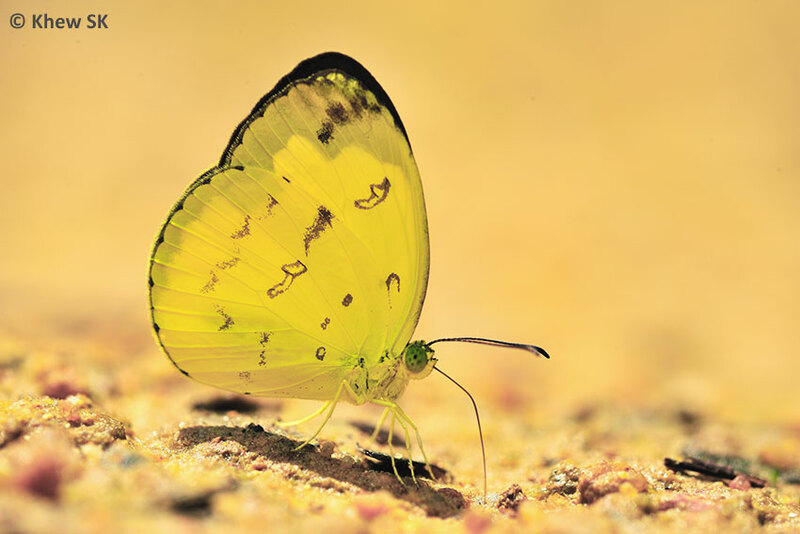 From 2015, ButterflyCircle has been working with the Lee Kong Chian Natural History Museum by supplying DNA material to set up a DNA barcode database for Singapore butterfly specimens. 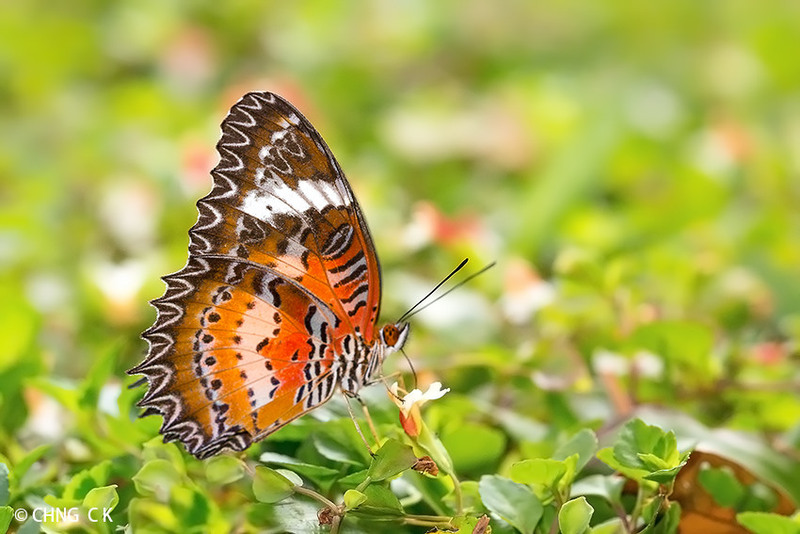 This is to ensure that the DNA data will be available for future reference when the technology is more conducive for the use of DNA to reliably identify butterflies. 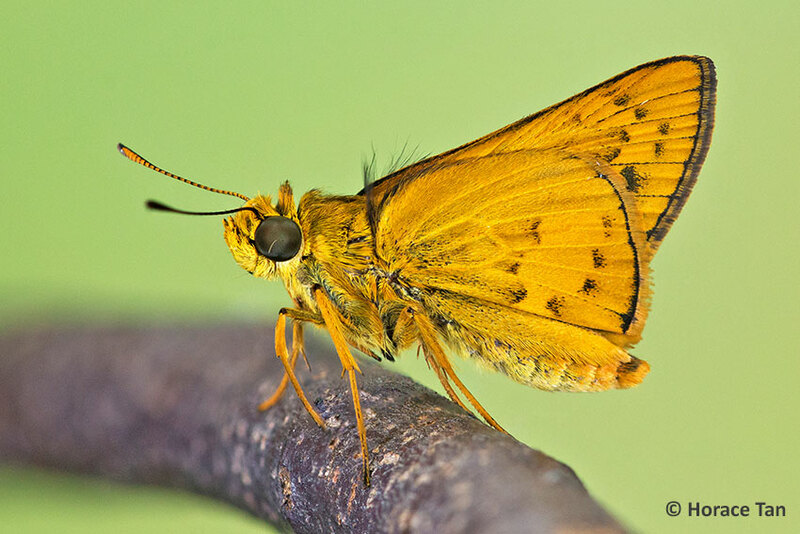 There are currently no fewer than 10 species that are still under investigation and for which voucher specimens are being sought to validate the identity of these butterflies. 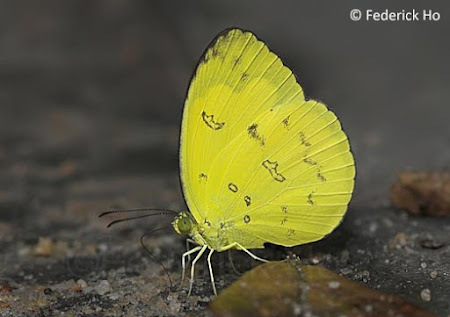 These are mainly lookalike species in the Lycaenidae and Hesperiidae families. In a forthcoming blog article, we will feature two more Lycaenidae species that will be added to the Singapore Checklist. 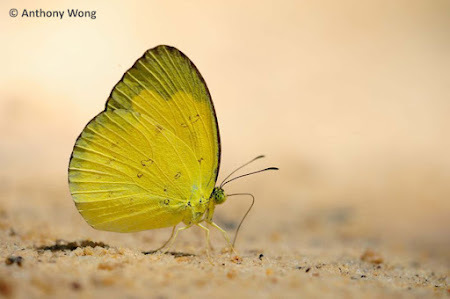 Special thanks to Horace Tan for his patience and effort in documenting the early stages of these species and to Dr TL Seow for his persistence in scrutinising the voucher specimens to identify the species with a high level of confidence. 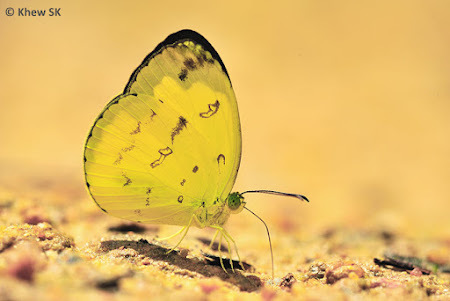 *[C&P4] The Butterflies of The Plain Peninsula, A.S. Corbet and H.M. Pendlebury, 4th Edition, Malaysian Nature Society. 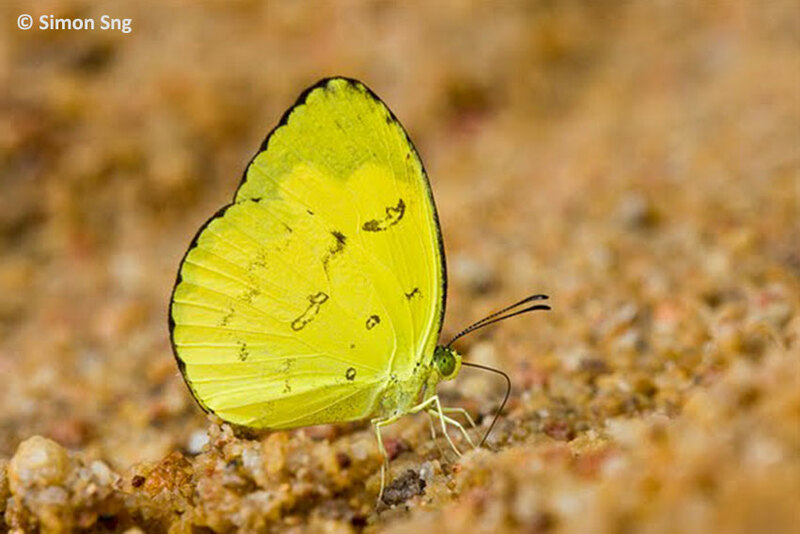 All voucher specimens, host plants and early stages collected within Parks or Nature Reserves under the jurisdiction of the National Parks Board are done with the permission of the National Biodiversity Centre Division of NParks. Specimens will be submitted to the Lee Kong Chian Natural History Museum's Lepidoptera Collection for reference. The month of September 2015 will probably go down in Singapore's political history as an exciting month as 2,460,977 voters went to the polls on 11 Sep 2015. For the first time since independence in 1965, all 89 electoral seats were contested. This time around, up for grabs were 16 Group Representation Constituencies and 13 Single Member Constituencies. It was a very eventful period leading up to Polling Day as each political party held rallies, interviews and podcasts to articulate their manifestos and to persuade the electorate why they should be the voters' representative in Parliament. Social media played a key role, as Singaporeans turned to their favourite cyberspace platforms to read, comment and absorb all the excitement of the once-in-five year hustings. On the environmental front, the almost-annual scourge that has become all-familiar with Singaporeans, Malaysians and Indonesians reared its ugly head once again. In the past week, many areas in the 3 countries were shrouded in the choking smog as large tracts of land were razed to the ground in Sumatra and Kalimantan. This yearly affair of clearing forests by burning the land during the dry season appears to have continued despite the Indonesian authorities' warnings to plantation owners. One wonders how and when this persistent destruction of the land will stop? It is unimaginable that the Indonesian authorities are powerless to prevent this yearly damage. The feeling of helplessness and frustration that Malaysians and Singaporeans feel when the haze descends on us returns year after year with no end in sight. People with respiratory problems or sensitive to the acrid smog in the air will usually have to suffer in silence. 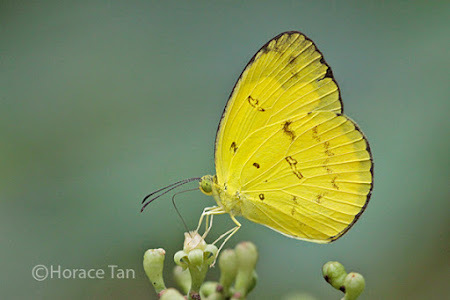 The NParks Butterfly Count is ongoing (5-13 Sep) and it will be interesting to see how the haze will affect the numbers and diversity of the butterflies found in our urban parks and gardens. 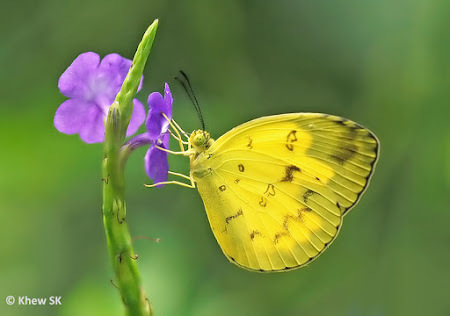 In previous years, when the haze was particularly thick and prolonged, the butterfly population was affected where the numbers dropped significantly. 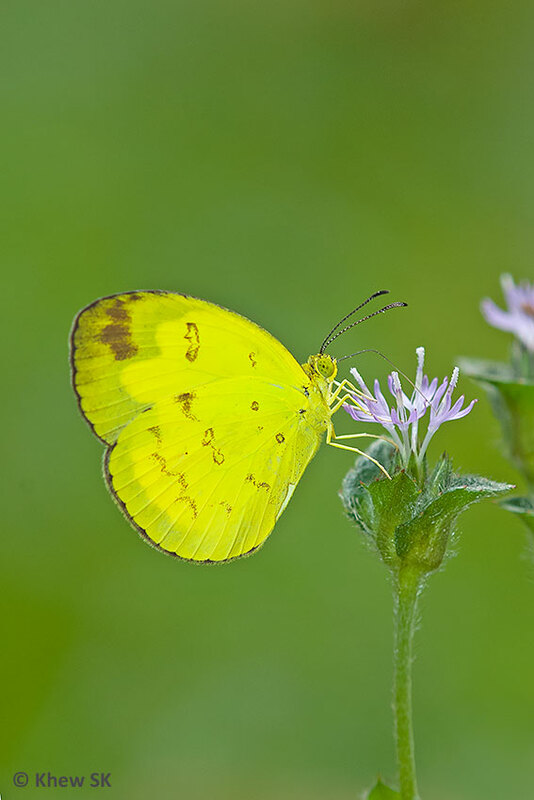 Our Butterfly of the Month for September 2015 is the Anderson's Grass Yellow. 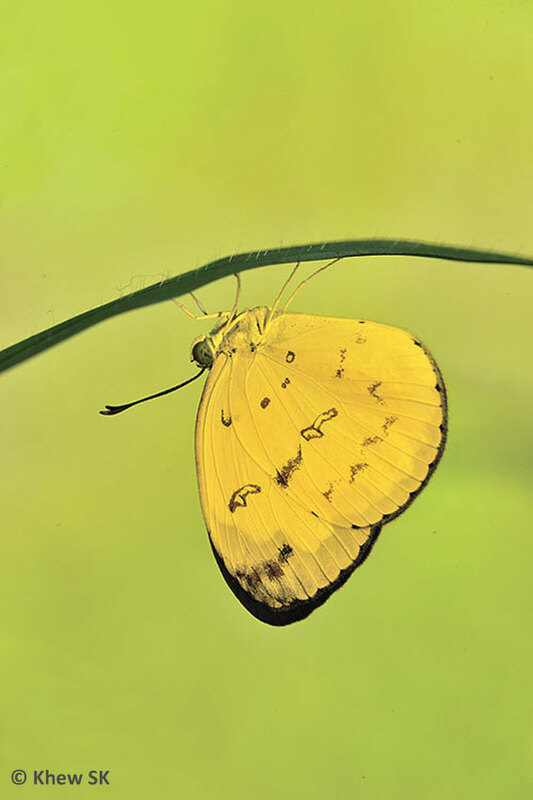 This species is one of six Grass Yellows from the genus Eurema found in Singapore. Unlike some of its cousins, the Anderson's Grass Yellow is almost found exclusively in the forested areas. It is moderately common where it occurs in the nature reserves, but cannot be said to be anywhere near the abundance of related species like the Common Grass Yellow and the Three Spot Grass Yellow. 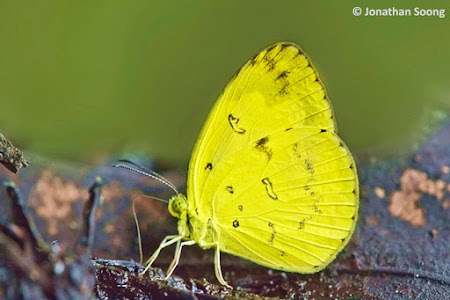 The Anderson's Grass Yellow has a forewing length of about 17-20mm on average. 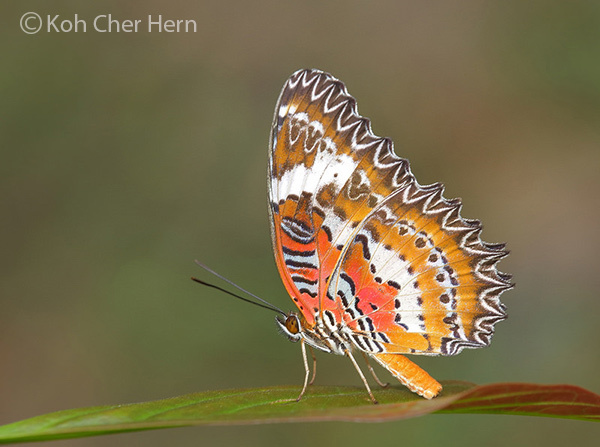 occasionally, very small individuals are observed where the forewing length may drop to about 13-15mm. The species is usually found feeding on flowering plants along the fringes of the nature reserves. Males of this species are also fond of puddling at sandy streambanks. More often than not, they are encountered singly, unlike the congregations of Common, Three Spot and Chocolate Grass Yellows that are occasionally encountered. 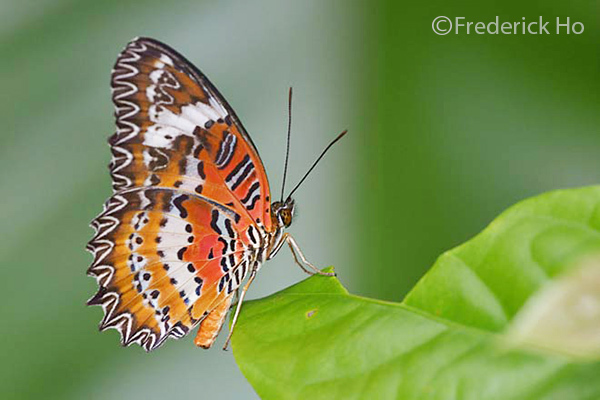 They also display a habit of flying and hiding on the underside of a leaf to rest upside down. However, the butterfly is alert and skittish and is not easy to photograph when fluttering around. 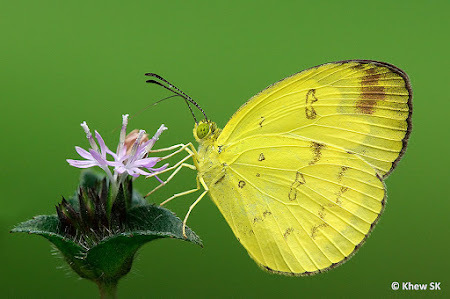 The Anderson's Grass Yellow can be separated from the other lookalike Grass Yellows by a single cell spot on the underside of its forewing. There is usually a dark brown sub-apical streak on the forewing (which can sometimes be very indistinct or even absent). The upperside of the butterfly is a rich yellow with black marginal border on both the fore- and hindwings. The species has been successfully bred on Ventilago maingayi and Ventilago malaccensis.The host plant is found growing wild in the forested nature reserves of Singapore. The plant is quite unique in that the young leaves of the plant are deep red whilst the mature leaves are green. 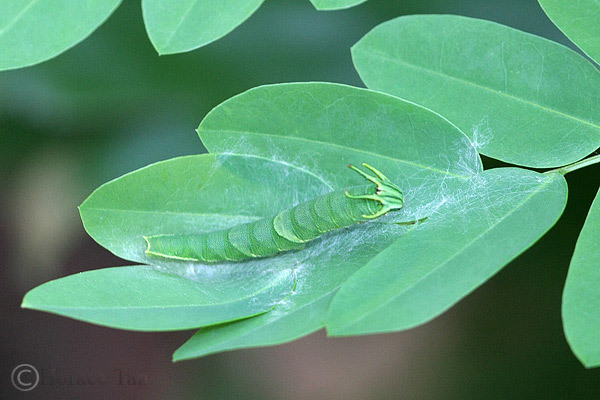 The caterpillars feed almost exclusively on the young leaves. This 3rd instalment of our Butterflies' Larval Host Plants series features Adenanthera pavonina, a species in Fabaceae (bean family) which is a family of flowering plants known for their nitrogen-fixation ability. 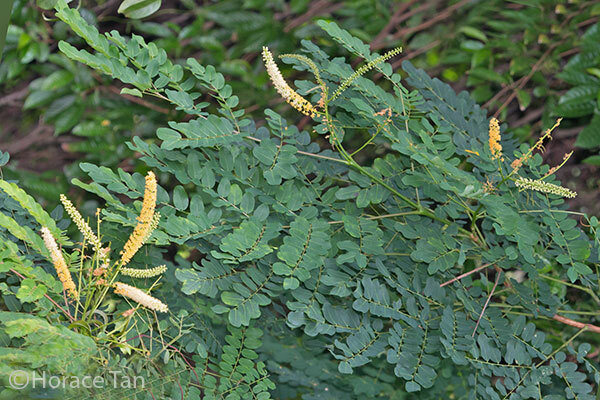 With about 18000-old species, Fabaceae is the third largest land plant family, and its members take on a variety of growth forms (trees, shrub, herb, vine, liana). The Saga Seed tree is a perennial member which assumes the tree form. 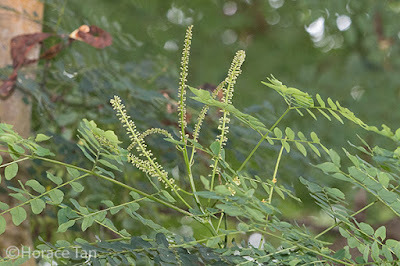 The Saga Seed tree is native to India and Southern China, but it has been introduced to many countries in the tropics. In Singapore, it is commonly planted in parks/gardens and on roadside for shade and ornamental purposes. 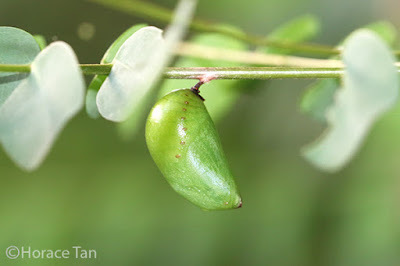 It is noteworthy that one particular Saga Seed tree in the Singapore Botanic Garden has even achieved the Heritage Tree Status. Different parts of the Sage Seed tree have been shown to serve useful purposes. For examples, the timber has been used in house and cabinet making, and the wood produces a red dye and used in tonics. Larval Host for Butterfly Species: Plain Nawab, Blue Nawab and Common Imperial. Two Saga Seed trees growing on the side of a jogging track in Jurong Lake Park. 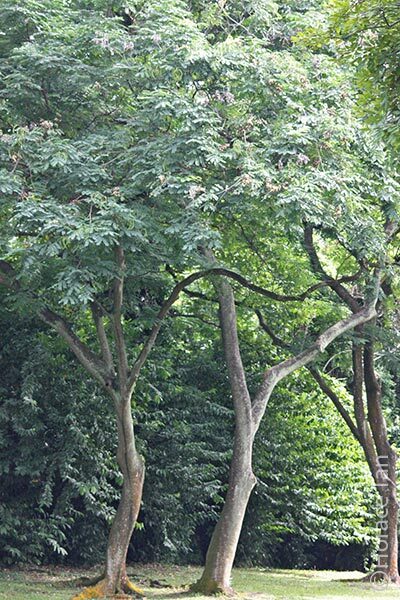 A fast growing tree with spreading canopy, the Saga Seed tree can grow up to 20m. It features compound bipinnate leaves. 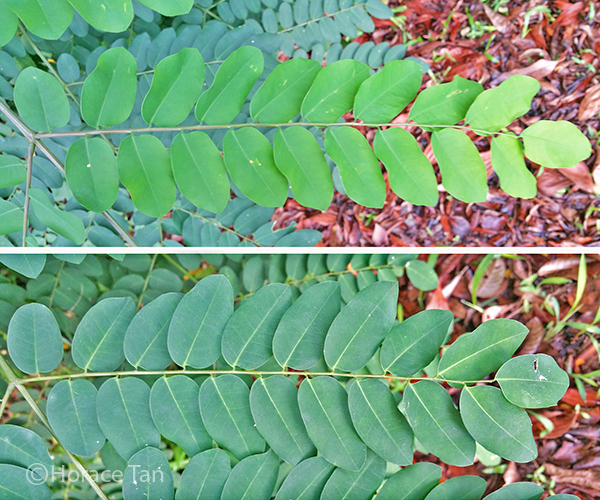 Each leaf is about 10-40cm long with up to 6 pairs of side stalks each of which bearing 9-15 pairs of leaflets. 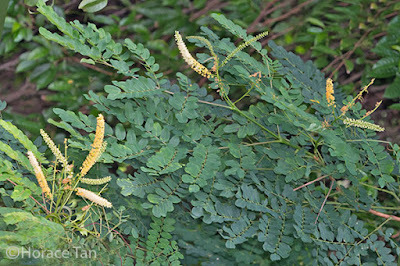 The leaves are shed every 6-8 months, with the leaves turning from green to yellow before dropping off. 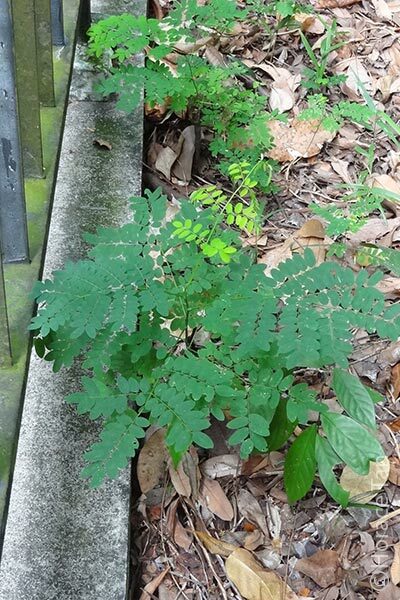 Saplings of the Saga Seed tree found alongside a pavement in the Mount Faber Park. A young leaf in the early stage of growth. 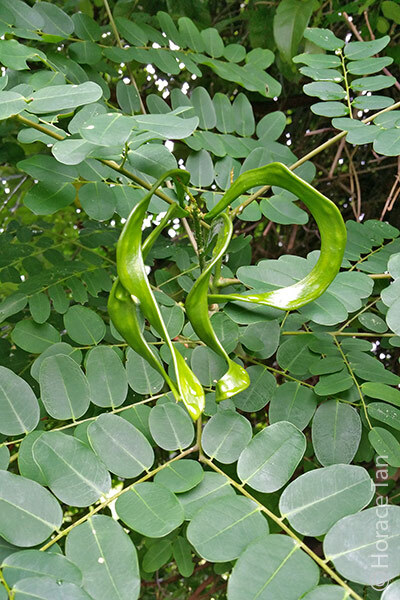 The young developing leaves are yellow to yellowish brown, but turning yellowish green to dark green when they mature. 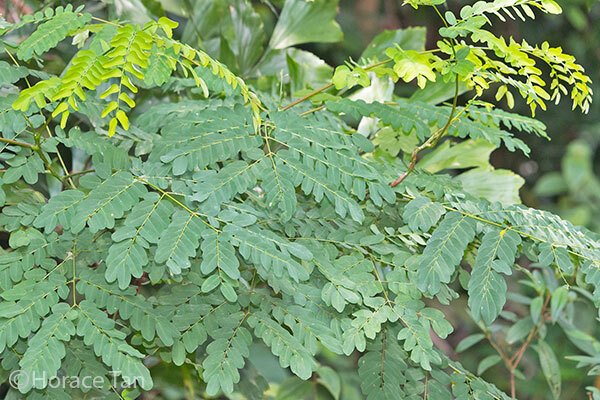 The young leaves are edible, and have been used with the bark to make a decoction in traditional medicine for treatment of diarrhoea. 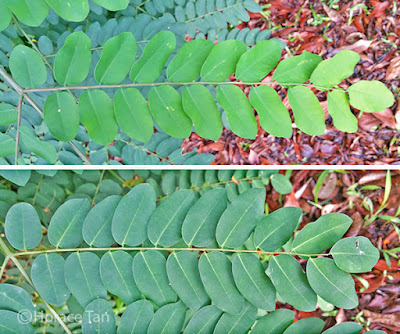 Two side stalks of leaflets, with the lower one fully matured. 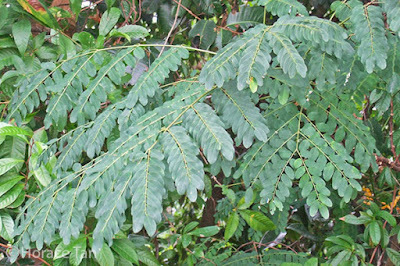 Mature leaves of the Sa. 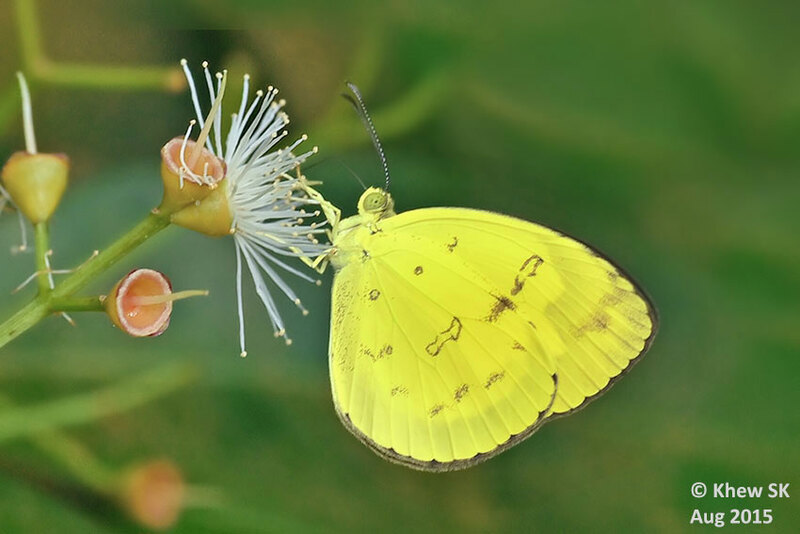 Flowers of the Saga Seed Tree are small and creamy yellow. They occur in dense clusters on long stalks (8-12cm long). 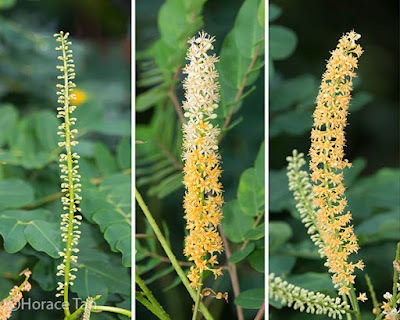 These flowers are faintly scented and turn dull orange when they age. Stalks of flower buds of the Saga Seed Tree. Stalks of flowers and flower buds of the Saga Seed Tree. 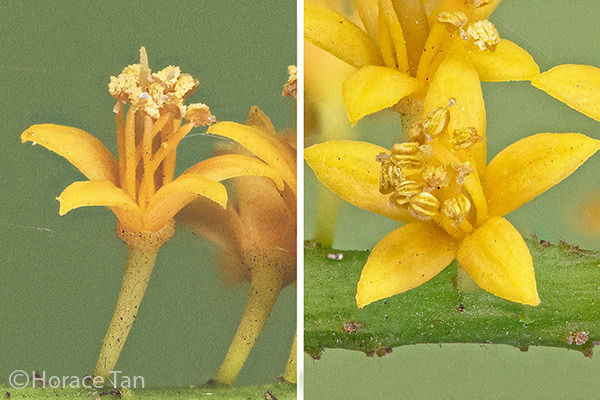 Close up views of a stalk of flower bud (left); flowers (centre, right). Close up view of young flowers. Close up view of individual flowers. The fruits occur in long (10-20cm), curved pods. As a pod develops, bulges corresponding to the location of seeds grow in size. The pod turns brown when it is ripened, and it then splits open in two twisted halves to reveal the scarlet seeds. 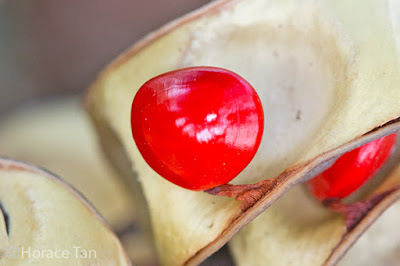 Each seed is hard and near heart-shaped. 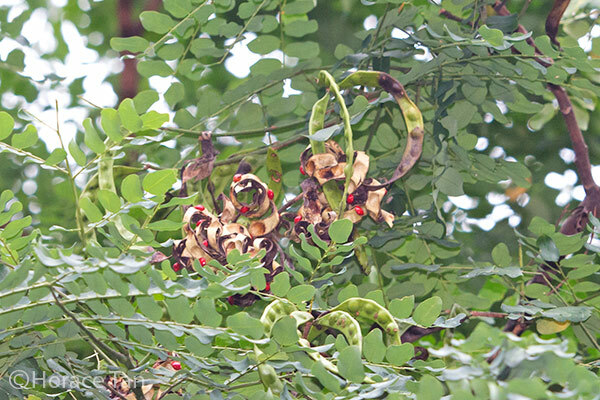 The ripened pods will eventually fall and litter the ground below the tree. Cooked seeds are edible although the raw seeds are toxic. 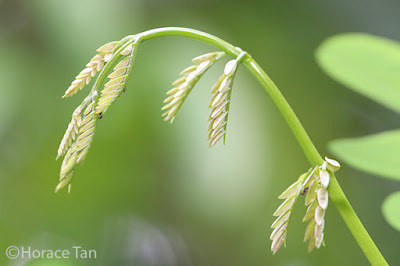 The seeds have many other uses including being used as beads in jewellery (as beads), as industrial lubricants (oil extracts from seed), as unit of weights in ancient India and even as symbols of love in China (Chinese name: 相思豆). Young fruits of the Saga Seed Tree with the bulges barely noticeable. 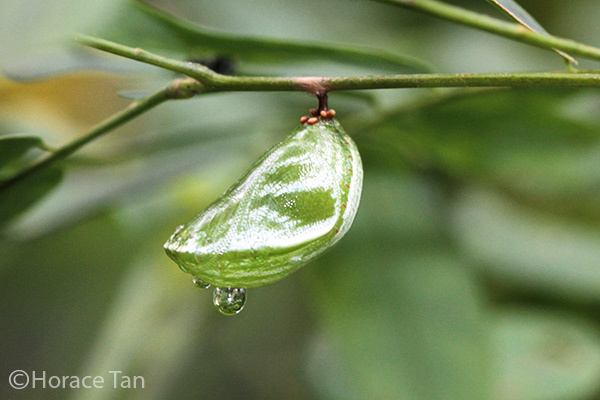 Fully developed pods of the Saga Seed Tree. 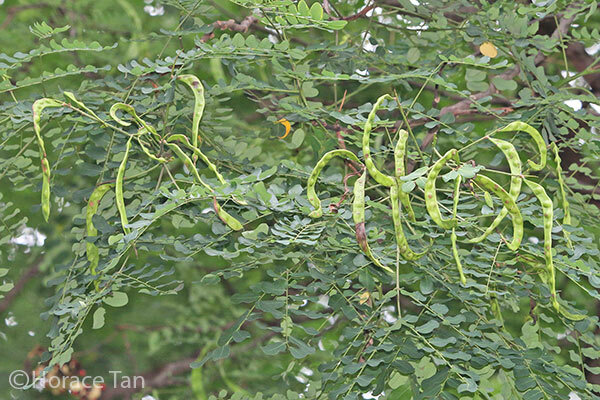 Ripened pods still attached to the mother tree. 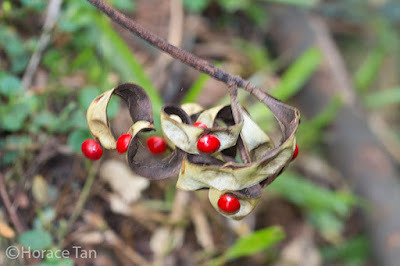 Close-up view of a ripened pod fallen to the ground. Close-up view of a seed of the Saga Seed Tree. In Singapore, the Saga Seed tree also serves as the larval host plant for three butterfly species: Plain Nawab, Blue Nawab and Common Imperial. 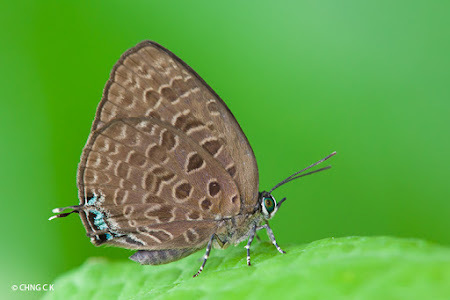 The first two are Charaxinae (a nymphalid subfamily) species, while the last one is a lycaenid. Eggs of these three butterfly species are typically laid by the mother butterfly on the stem/leaves of a young plant of the Saga Seed Tree at low heights (knee height to chest level). The eggs of the two Nawab species are mostly found laid on the upperside of a leaflet, with a few on the underside. A female Plain Nawab laying an egg on the underside of a leaflet of the Saga Seed Tree. 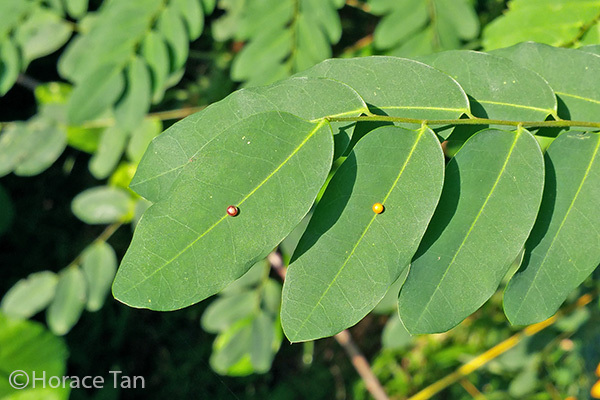 An egg of the Plain Nawab found a leaflet of the Saga Seed Tree. 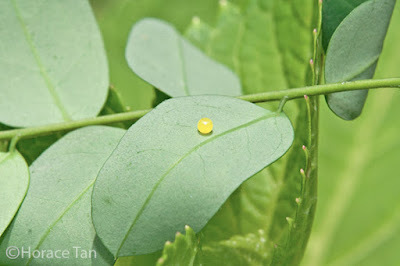 Eggs of the Blue Nawab found on the upperside of leaflets. 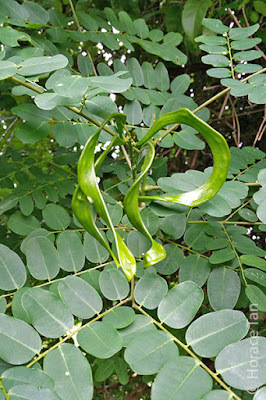 Caterpillars of all three species feed on leaflets of the Saga Seed Tree. 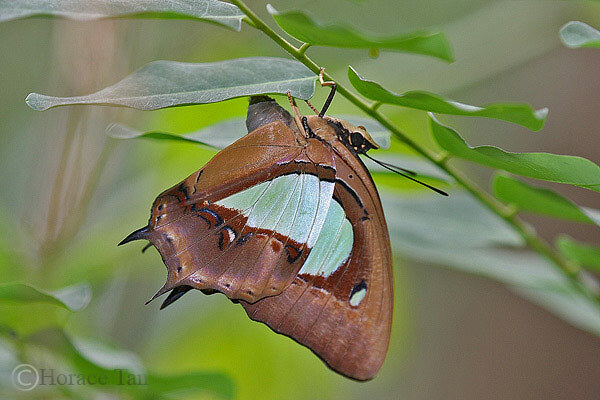 The two Nawab species have the habit of building a "base camp" made from weaving several adjacent leaflets together. 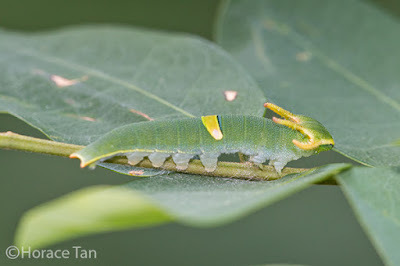 A late penultimate instar instar caterpillar of the Plain Nawab resting in its base camp on a Sage Seed Tree in the Mount Faber Park. 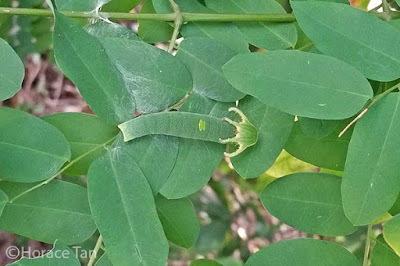 An early 5th instar caterpillar of the Blue Nawab found alongside a park connector track in the west. 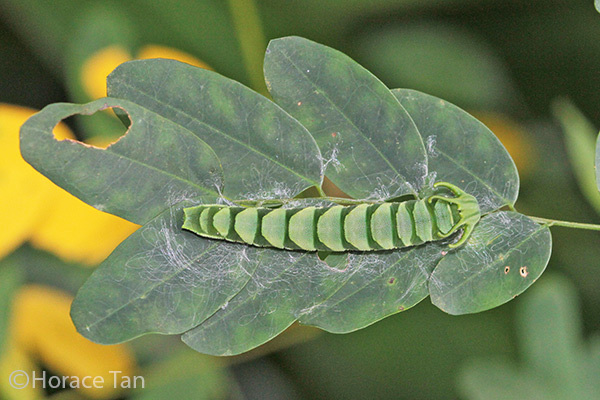 A final instar caterpillar of the Plain Nawab in its base camp found in the Telok Blangah Hill Park. A final instar caterpillar of the Blue Nawab in its base camp found in the west. Caterpillars of the two Nawab species typically pupate on the same Saga Seed Tree they have been feeding on. 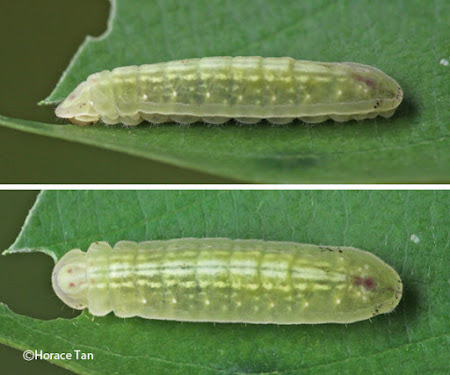 The pupation site is usually the underside of a stem or the rachis of a compound leaf. 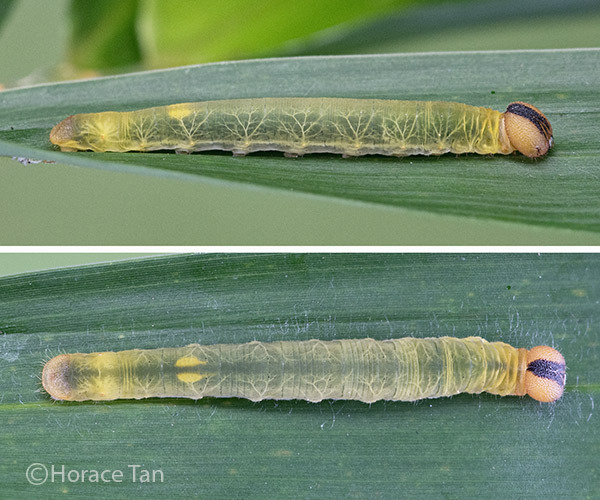 Likewise for Common Imperial, the pupation site is usually a spot on the stem of the same plant it feeds on. A pupa of the Blue Nawab found in the vicinity of the Chinese Garden. A pupa of the Plain Nawab found in the Dairy Farm Nature Park. If you happen to encounter a young Saga Seed tree in your next outing in the field, try to look for the odd sight of a few leaflets weaved together. If you do find one, chances are you have found the base camp of a Nawab caterpillar and even the caterpillar itself. 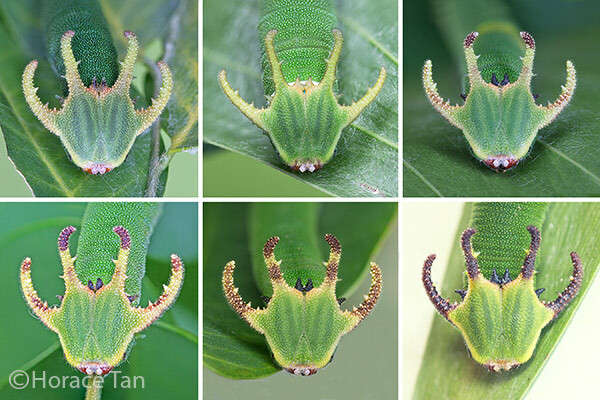 The most striking feature of Nawab caterpillars is their dragon-like head, hence it would be rather easy for you to know that you have found the real McCoy. Saga Tree - WideSingapore Blog. 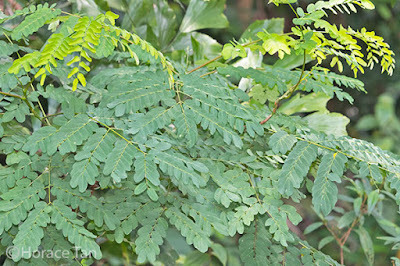 Saga Seed Tree, Naturia web site.